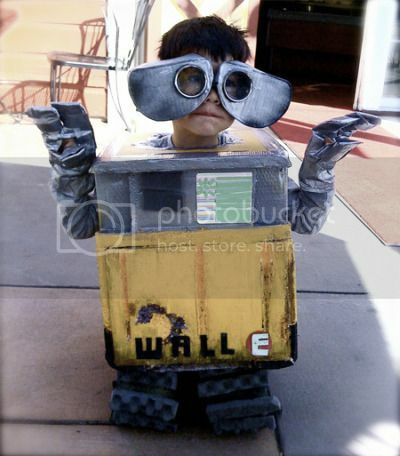 Is this Wall-E costume like a magician’s trick or something? Are this kid’s legs temporarily in another box somewhere else? Via jirlznae, who refrains from making jokes about legless children. Because she’s so busy making fun of the armless ones. The old “crawling on knees and pretending to be tiny” trick. Pretty painful though. It definitely looks like he’s kneeling, and the curve of the bottom part is actually his knees. I imagine the kneeling was just for the effect. I thank you for your concern about my concern. No probs. Just quelling your anxiety. This is adorable. This kid should go into acting or something, post up an audition for something on that site I Made A Movie wearing this costume! As the father that built this costume for my then 4 year-old son, I’m amazed to see this pop up every once and awhile. He had on a pair of sweats with egg-crate glued and spay painted black. As the “Trick Or Treat” trick, he would kneel for candy.